We have taken significant steps to transform our company for the better. As a result of the hard work of our entire team, an action-oriented improvement plan and a sharp focus on results, we emerged from 2016 a stronger and more confident organization, well positioned for the road ahead. This was positively reflected in our stock’s performance and increased profitability as we moved through the year. As always, we are committed to providing exceptional experiences for our customers and serving as their trusted advisor, while diligently working to reduce costs and drive efficiencies. Although we have consistently posted superior average loans and deposits per employee relative to our peers, we recognized that we needed to do more to improve returns and enhance shareholder value. As a result, in July 2016, we announced a transformational, enterprise-wide initiative to help grow efficiency and revenues, which we call GEAR Up. Today, GEAR Up is already making a substantial contribution to our bottom line. Through GEAR Up, we identified and began in earnest executing on more than 20 work streams. As promised, we achieved more than $25 million in expense savings in 2016. In total, by the end of 2018, we expect to drive at least $270 million in additional pretax income, relative to when we began the program. Expanded product offerings, enhanced sales tools and training and better customer analytics are expected to increase customer penetration of our products. We’ve also streamlined leadership across our organization to support speed and simplicity of getting business done, which has resulted in renewed vigor and focus for our colleagues. We’ve taken a multifaceted approach to cutting costs, including reducing our workforce by approximately nine percent, redesigning our retirement program, optimizing real estate, streamlining operational processes, selectively outsourcing technology functions and reducing technology system applications. Workforce reductions included the elimination of about 30 percent of our management positions in order to get closer to our customers and accelerate decision making, while ensuring we maintain our high standards for customer service and deep expertise and experience. Our new retirement program continues to provide highly competitive benefits and is expected to contribute approximately $33 million in savings in 2017. We are implementing technological enhancements, such as digitizing our credit processes to enhance data collection and analysis and improve the customer experience, as well as optimizing our infrastructure and substantially reducing the number of IT applications across the bank. And we have also begun rationalizing our real estate. While we remain committed to our footprint, with the advancement of technology and customers' migration to a broader use of digital channels, we need less space to operate our business. The consolidation of 38 banking centers, or about eight percent of our network, of which four were closed in the second quarter and 15 were closed in the fourth quarter, is expected to result in $10 million to $13 million per annum in savings. This is net of customer attrition, which is expected to be nominal as we have another banking center within two to five miles for the bulk of the locations that are being closed. Also, we have developed a plan to consolidate operations and office space, and are targeting a 500,000-square-foot reduction in real estate, which should result in approximately $7 million in savings in 2018. Collectively, these actions take us a long way towards our goal of achieving a double-digit return on equity in 2018. We expect to meet or exceed this goal with sustained growth, net of investment, normal credit costs, continued equity buybacks and assuming only a modest increase in rates. In addition, we are targeting an efficiency ratio of at or below 60 percent by year-end 2018 and we believe that the December increase in rates will help us reach this goal even faster. Importantly, while rising rates can be a significant benefit to Comerica, we are committed to these initiatives and are not relying on rate increases or a better economic environment to achieve our objectives. We believe our stock’s performance in part reflects that investors recognize the value of our GEAR Up initiative. In 2016, Comerica's stock increased 63 percent, compared to a year ago, outperforming all of our peers as well as the KBW Index and S&P 500 Index. In fact, in the S&P 500 Index, we were the best performing financial stock and among the top 10 performers overall. I, along with our executive team, remain very confident that we will continue to meet the financial targets that we have established for GEAR Up. We expect the actions we are taking will ensure that we remain a strong partner and trusted advisor for our clients in the future, while enhancing shareholder value and achieving a higher level of returns for our shareholders. We reported 2016 net income of $477 million or $2.68 per share, which included $0.34 in restructuring charges. Earnings per share increased six percent over 2015, excluding these restructuring charges,* as we began to reap the benefits of our GEAR Up initiatives, as well as rising rates. Also, we increased the size of our equity buyback by 25 percent, which is a reflection of our strong capital position and solid financial performance. Excluding the $641 million reduction in energy loans, average loans increased over $1 billion or 2 percent. The most notable increases in average loans came from areas where we have deep expertise, such as Commercial Real Estate, National Dealer Services, and Mortgage Banker Finance. Average deposits have grown 32 percent over the last five years and reflect our focus on building long-term client relationships. In 2016, noninterest-bearing deposits increased $1.7 billion, or 6 percent, while interest-bearing deposits declined $2.2 billion. Altogether, total average deposits declined one percent and reflected the adjustments made in early 2016 for the new Liquidity Coverage Ratio (LCR) requirements, which were mostly offset by significant growth in the third and fourth quarter of 2016. *Earnings per share decreased 6 percent over 2015, including restructuring charges. For 2016, earnings per share excluding restructuring charges is calculated by taking the net income available to common shareholders ($473 million), plus restructuring charges net of tax ($59 million), divided by diluted average common shares (177 million). We had $1.8 billion of net interest income in 2016, an increase of 6 percent, primarily the result of higher interest rates, loan growth and a larger securities portfolio, partially offset by modestly higher debt costs. Credit quality continued to be strong. The provision for credit losses increased primarily due to a larger reserve required for Energy loans in the first quarter of 2016, partially offset by improvements in the remainder of the portfolio. Net charge-offs of 32 basis points were at the low end of our through-the-cycle average, and excluding energy line of business, our net charge-offs were 13 basis points. With respect to noninterest income, customer-driven fees increased $22 million, or over two percent. We had a large increase in card fees, as well as growth in fiduciary, foreign exchange and brokerage fees as we continue to focus on growing and expanding relationships. Noninterest expenses declined $23 million after excluding restructuring charges of $93 million, as well as a $33 million release of litigation reserves in 2015. Our GEAR Up initiative drove over $25 million in expense savings. In June 2016, we announced that the Federal Reserve did not object to our 2016 Capital Plan. In April and July 2016, our board of directors increased the quarterly cash dividend for common stock by 5 percent and 4.5 percent, respectively, to 23 cents per share. We repurchased 6.6 million shares in 2016 under our equity repurchase program. Through the buyback and dividends, we returned $458 million, or 96 percent, of 2016 net income to shareholders. Our regulatory capital levels remain comfortably above the threshold to be considered well-capitalized. **See Supplemental Financial Data section for reconcilements of non-GAAP financial measures. Our relationship banking strategy and balanced geographic markets are important drivers of our success. Comerica strives to be the trusted advisor to our clients, providing them with financial products and services they need to prosper. Our geographic footprint is well situated and provides diversity and significant growth opportunities. We remain committed to delivering exceptional customer experiences that exceed expectations and deliver a higher level of banking. Regarding our footprint, we have a strong presence in the major metropolitan areas of Texas, California and Michigan, providing us with a balanced market presence. We also have locations in Arizona and Florida, with certain businesses operating in several other states, as well as Canada and Mexico. While our unique geographic footprint provides us with economic diversity, we operate as ‘one bank’ and our policies, procedures and systems are integrated across our footprint. A single platform provides significant synergies and is highly efficient and cost effective. TEXAS: We’ve had a presence in Texas for almost three decades and moved our corporate headquarters to Dallas nearly 10 years ago. We have operations throughout Dallas-Fort Worth, Houston, Austin, and San Antonio. We continue to leverage our standing as the largest U.S. commercial bank headquartered in the state to generate new customer relationships. The Texas economy has proved to be very resilient in adjusting to the challenging low oil price environment. We believe that the state’s important energy sector is starting to turn the corner, aided by firmer prices and strong demand. We expect Texas to continue to generate new jobs and business opportunities, supported by a healthier energy sector and a stronger U.S. economy in 2017. CALIFORNIA: We have had a presence in California for more than 25 years. San Jose serves as our market headquarters. Additionally, we have a presence in the Greater San Francisco area, Los Angeles, Orange County, San Diego, Sacramento, and Santa Cruz/Monterey. We expect California’s economy to be a solid performer in 2017. Expanding U.S. and global economies plus the accelerated diffusion of new technologies into the broader economy will support the state’s important technology sector. Likewise, improving domestic and international economic conditions are positive factors for the state’s entertainment industry. MICHIGAN: In Michigan, we operate in Detroit, which is our market headquarters, as well as in the Detroit metropolitan area, Ann Arbor, Battle Creek, Grand Rapids, Jackson, Kalamazoo, Lansing, Midland, and Muskegon. We have maintained a continuous presence in Michigan since 1849, and continue to hold the second largest deposit market share in the state, based on the latest FDIC deposit market share survey. The Michigan economy continues to improve, buoyed by a strengthening manufacturing sector. U.S. auto sales remain strong and the auto industry is in the midst of an exciting surge in new technologies, including the innovation of state-of-the-art “smart car” driving systems. Michigan’s leading academic institutions are playing a key role in developing these new technologies and incubating new business opportunities. In addition to our diverse footprint, growth is driven by our three strategic lines of business. Our model continues to be weighted toward commercial banking through our Business Bank and complemented by the Retail Bank and Wealth Management. Within the Business Bank, Middle Market Banking remains our "bread and butter." It is where we have a competitive advantage due to the depth and breadth of our expertise in this area. As part of our GEAR Up initiative, we are taking steps to nationalize our middle market sales process. We are doing this by leveraging our best practices and conducting business in a consistent manner throughout our enterprise. Our focus is on sales enablement, organizational consistency, operational efficiency and talent management. Nationalizing our middle market sales process will be an important initiative for us throughout 2017. And it is expected to result in improved productivities, revenue generation and reduced expenses. In May, Comerica was honored to be selected by the U.S. Treasury to be their Financial Agent providing merchant card services, also known as Card Acquiring Services. With a five year contract, this business includes approximately 7,000 merchant accounts, representing a multitude of government agencies, and an estimated $12 billion in annual payments volume. This expands our relationship with the U.S. Treasury, which already included DirectExpress®, the program that provides Social Security payments via a pre-paid card, and myRA®, a savings option for those who do not have access to a retirement savings plan at work. Our Retail Bank continues to focus on ensuring we have the products, services and locations to meet customer needs. In addition to strategically repositioning our banking center network through consolidations and relocations, we completed more than two dozen interior refurbishments in 2016, which included transitions to new design concepts and teller cash recyclers to improve efficiency. We also successfully deployed transformational technologies at our Greenville banking center in Dallas, building upon the successful deployment of these technologies at banking centers in Michigan and California. Approximately 90 percent of transactions at the Greenville banking center are processed via the ATMs and BankerConnect, our interactive teller-like machine. In addition, we introduced Comerica-branded ATMs at the highly-trafficked Detroit Metropolitan Airport. Also within the Retail Bank, we made Web Banking and Bill Pay upgrades, including the launch of Web Banking Combined View, which allows our Web Banking customers to combine accounts with different taxpayer identification numbers under one Web Banking ID, fulfilling a significant customer request. Furthermore, we launched a web-based Comerica Insurance Services platform that enables customers to compare shop and buy a variety of insurance products from multiple providers. Small Business successes in 2016 included the integration of a new centralized underwriting center that supports relationships up to $1.5 million in exposure. This contributed to improved speed-to-market for these types of loans. Wealth Management enables us to bring private banking, investment management and fiduciary services to our Business Bank and Retail Bank clients. In large part due to our GEAR Up initiative, Wealth Management made notable progress in growing loans and fee income, while controlling expenses, and managing risk appropriately. In 2017, we will launch the Wealth Productivity Transformation initiative, which includes the implementation of a relationship management tool that we believe will enable our colleagues to drive market share and better serve our clients. Wealth Management also expects to leverage technology to increase productivity, increase share of wallet, and reduce time to close. The Federal Reserve increased its benchmark rate 25 basis points in December 2016, marking only the second change it has made to the short-term benchmark rate in eight years. As I previously mentioned, our 2016 financial results benefited meaningfully from the December 2015 rate increase. 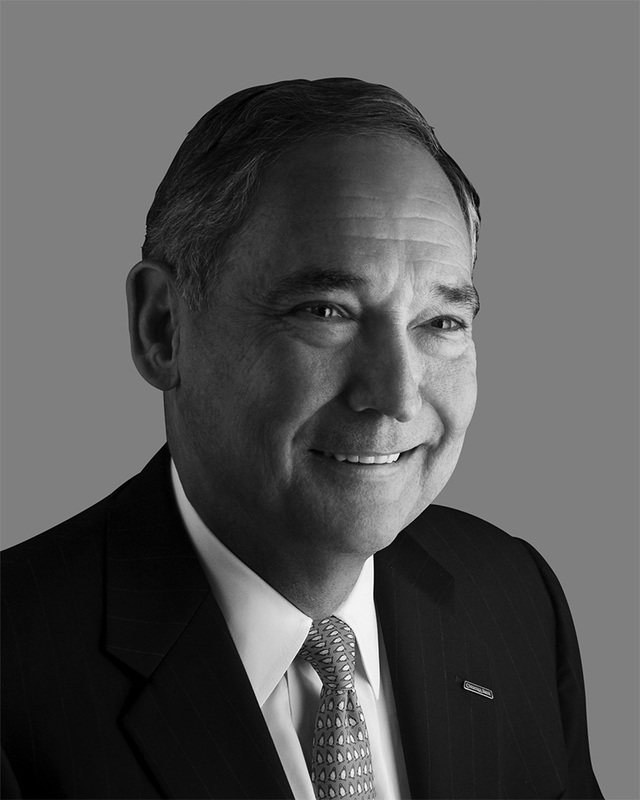 Comerica's business model continues to be well positioned for a rising rate environment. Our balance sheet is sensitive to movement in interest rates, since the majority of our revenue is derived from the interest we receive on loans we provide to our clients. Our loan portfolio represents over two-thirds of our total assets as of December 31, 2016, and over 90 percent of our loans are floating rate. Therefore, as rates rise, our portfolio reprices quickly. In addition, more than 50 percent of our deposits are noninterest-bearing, and, as such, are less impacted by movement in rates. They also provide us a source of low-cost funding as loan growth continues. At year-end 2016, our energy loans had declined $820 million, or 27 percent, from one year ago, bringing our Energy line of business to less than five percent of our total loans. Energy Services, which has been most significantly impacted this cycle, represented less than one percent of our total loan portfolio. The performance of our Energy portfolio has improved. While oil prices have been relatively stable, we continue to be cautious and believe we are properly reserved with our loan loss reserve allocation at over seven percent of Energy loans as of December 31, 2016. We remain committed to the energy sector and believe that in cycles such as the current one, we can further cement our relationship with our clients. Our board appointed two new independent directors in 2016: Michael Van de Ven, who is the chief operating officer of Southwest Airlines, and Mike Collins, who had a distinguished 37-year career at the Federal Reserve Bank of Philadelphia. We have a strong and diverse board with a good mix of industry, financial and leadership backgrounds. Given the regulated nature of our industry as well as its cyclicality, we believe it is important to have long-tenured directors with a deep understanding of our business and environment. However, we also recognize the importance of bringing fresh perspectives. The cybersecurity threat environment is intensifying and Comerica's defenses are ready. Over the past several years, Comerica has met this escalating environment with significant investments in its cybersecurity defensive posture, building a robust program with advanced identification, protection, detection, response and recovery capabilities. We have established a cybersecurity capability that leverages industry standard frameworks and targeted regulatory guidance to provide wide coverage, which we evaluate regularly through independent assessments. Our security operations center and intelligence capabilities are monitoring our systems 24/7, constantly adjusting our defenses to the changing threat environment. The national election is bringing change to Washington, D.C. and with it, optimism for regulatory relief for banks, particularly those of our size. It now appears to be a legislative priority to reduce complex and costly regulations that burden banks and impact the flow of credit to businesses. We believe there is potential for revision or elimination of certain aspects of the Dodd-Frank Wall Street Reform and Consumer Protection Act that could benefit Comerica and the industry as a whole. This includes changes to the definition of a systemically important financial institution (SIFI) from the current $50 billion and above in assets to either a higher asset threshold or a metrics-based formula to determine a firm's true complexity and risk profile. We believe a positive change to the SIFI designation would be a major step toward the kind of regulatory relief that would potentially spur increased lending to businesses, reduce compliance expenses, and allow us to manage capital and liquidity to meet our needs in a more prudent manner. Comerica continued its commitment to the communities in which we operate in 2016. Comerica contributed more than $8 million to not-for-profit organizations in the markets we serve, and, in addition, our employees raised nearly $1.7 million for the United Way and Black United Fund. Our team also donated their personal time and talents - about $1.3 million worth in volunteer hours - to make a positive difference in our local communities. Some of the recognition we received for our efforts included the prestigious Corporate Social Responsibility Award from the Financial Services Roundtable. In addition, Comerica was named as one of the 50 most community-minded companies in the nation as part of the Civic 50, an initiative of Points of Light, the world's largest organization dedicated to volunteer service. Our community “Shred Day” events continue to serve as the largest, most visible and most successful brand awareness, public education, colleague engagement, and community service campaigns that we host. Working with event partner Iron Mountain at shred-day events in Dallas, Houston, Phoenix and Detroit, we securely destroyed and recycled more than 800,000 pounds of paper in 2016, while gathering donations for local food banks. These signature events continue to provide a triple bottom line: helping reduce fraud and identity theft, freeing up hundreds of tons of space in local landfills, and raising awareness of hunger in our communities. We marked the fifth year of the Comerica Hatch Detroit Contest by more than doubling our commitment. In addition to providing the grand prize for the winning idea for a new retail business, we invested funds to help launch even more small businesses in the city. Fifteen new businesses are now open, thanks to the contest's success. We sponsored a similar contest in Dallas with the Dallas Entrepreneur Center and Tech Wildcatters. These contests offer us an opportunity to advance the aspirations of entrepreneurs in our markets. Diversity is an important core value at Comerica. We support 39 diversity-focused teams within the bank that promote employee engagement, business outreach, and diversity awareness and learning among colleagues. Comerica's focus on diversity has been favorably recognized, as we earned a third consecutive perfect 100 rating on the Human Rights Campaign Foundation's 2017 Corporate Equality Index, a national benchmarking survey and report on corporate policies and practices related to LGBT workplace equality. Black Enterprise magazine placed Comerica on its 2016 “40 Best Companies for Diversity” list. Comerica also ranked No. 2 on the DiversityInc 2016 Top 10 Regional Companies for Diversity. In addition, we were named to LATINO magazine’s 2016 “LATINO 100” list, the fourth annual listing of the top 100 companies providing the most opportunities for Latinos in such areas as education, hiring, workforce diversity, minority business development, governance and philanthropy. We also ranked among 2016's "Best Places for Women and Diverse Managers to Work" by Diversity MBA, which is a national leadership organization targeting leadership and talent management among professionals, managers and executives. In addition, Comerica was named among the "Top 25 Companies for Diversity in Texas" by the National Diversity Council. The award is based on women and minority representation in executive leadership and on boards of directors. We continued to expand our financial education efforts throughout our footprint in 2016, with some impressive results. The Comerica Money $ense program, which has been incorporated into the classrooms of 41 elementary schools throughout Maricopa, Palm Beach and Broward counties in Florida, is a web-based financial education program designed by leading technology company, EverFi. During the 2015-2016 school year, more than 2,100 students were served by the Comerica-funded program, with more than 6,000 learning modules completed to help predominantly low- and moderate-income students learn how to make wise financial decisions. Comerica recognizes the business value created through sustainability and that’s why it is embedded in our core values. We continued our progress on reducing our environmental footprint in line with Comerica’s 2020 Environmental Sustainability Goals and remain ahead of pace on our efforts to reduce greenhouse gas emissions, water consumption, and paper use by 2020. In addition, we exceeded our goal of reducing waste sent to the landfill four years ahead of schedule by achieving a 24.1 percent reduction compared to our goal of 20 percent. Also, Comerica continues to support a green economy with nearly $900 million of environmentally beneficial loans and commitments to companies in 13 different categories. In 2016, we were once again recognized for our climate change management strategy and emissions reduction efforts through CDP (formerly known as the Carbon Disclosure Project), receiving an “A-“ rating, among the highest scores in the U.S. financial services industry. Our work on supply chain sustainability earned Comerica its third consecutive Green Supply Chain Award from Supply & Demand Chain Executive magazine, and we were pleased to be listed on the FTSE4Good index series for the 8th consecutive year. In closing, 2016 was a pivotal year with the development and implementation of our enterprise-wide GEAR Up initiative. We have made significant progress in executing the expense savings and are fully committed to delivering on the efficiency and revenue opportunities to further enhance our profitability and shareholder value. We also benefited meaningfully from increased interest rates and our overall credit metrics remained strong as we continued to navigate the energy cycle. In addition, there has been much discussion in Washington, D.C. about plans to reduce taxes, provide regulatory relief and fiscal stimulus to drive economic growth. While there is no certainty as to what changes may prevail, we believe our customers and Comerica should benefit if changes are made. We believe we are well positioned for the future as our geographic footprint is well situated and our relationship banking strategy can drive superior growth of loans, deposits and fee income over time. At June 30, 2016 (the last business day of the registrant’s most recently completed second fiscal quarter), the registrant’s common stock, $5 par value, held by non-affiliates had an aggregate market value of approximately $7.0 billion based on the closing price on the New York Stock Exchange on that date of $41.13 per share. For purposes of this Form 10-K only, it has been assumed that all common shares Comerica’s Trust Department holds for Comerica’s employee plans, and all common shares the registrant’s directors and executive officers hold, are shares held by affiliates. At February 10, 2017, the registrant had outstanding 175,858,751 shares of its common stock, $5 par value. Items 10-14—Proxy Statement for the Annual Meeting of Shareholders to be held April 25, 2017. Comerica Incorporated (“Comerica”) is a financial services company, incorporated under the laws of the State of Delaware, and headquartered in Dallas, Texas. Based on total assets as reported in the most recently filed Consolidated Financial Statements for Bank Holding Companies (FR Y-9C), it was among the 25 largest commercial United States (“U.S.”) financial holding companies. Comerica was formed in 1973 to acquire the outstanding common stock of Comerica Bank, which at such time was a Michigan banking corporation and one of Michigan's oldest banks (formerly Comerica Bank-Detroit). On October 31, 2007, Comerica Bank, a Michigan banking corporation, was merged with and into Comerica Bank, a Texas banking association (“Comerica Bank”). As of December 31, 2016, Comerica owned directly or indirectly all the outstanding common stock of 2 active banking and 33 non-banking subsidiaries. At December 31, 2016, Comerica had total assets of approximately $73.0 billion, total deposits of approximately $59.0 billion, total loans (net of unearned income) of approximately $49.1 billion and shareholders’ equity of approximately $7.8 billion. Comerica has strategically aligned its operations into three major business segments: the Business Bank, the Retail Bank, and Wealth Management. In addition to the three major business segments, Finance is also reported as a segment. We provide information about our business segments and the principal products and services provided by these segments in Note 23 on pages F-102 through F-105 of the Notes to Consolidated Financial Statements located in the Financial Section of this report. Comerica operates in three primary geographic markets - Texas, California, and Michigan, as well as in Arizona and Florida, with select businesses operating in several other states, and in Canada and Mexico. We provide information about our market segments in Note 23 on pages F-102 through F-105 of the Notes to Consolidated Financial Statements located in the Financial Section of this report. Activities with customers domiciled outside the U.S., in total or with any individual country, are not significant. We provide information on risks attendant to foreign operations: (1) under the caption “Concentration of Credit Risk” on page F-29 of the Financial Section of this report; and (2) under the caption "International Exposure" on pages F-31 through F-32 of the Financial Section of this report. We provide information about the net interest income and noninterest income we received from our various classes of products and services: (1) under the caption, “Analysis of Net Interest Income” on page F-6 of the Financial Section of this report; (2) under the caption “Net Interest Income” on pages F-7 through F-8 of the Financial Section of this report; and (3) under the caption “Noninterest Income” on pages F-8 through F-9 of the Financial Section of this report. The financial services business is highly competitive. Comerica and its subsidiaries mainly compete in their three primary geographic markets of Texas, California and Michigan, as well as in the states of Arizona and Florida. They also compete in broader, national geographic markets, as well as markets in Mexico and Canada. They are subject to competition with respect to various products and services, including, without limitation, loans and lines of credit, deposits, cash management, capital market products, international trade finance, letters of credit, foreign exchange management services, loan syndication services, consumer lending, consumer deposit gathering, mortgage loan origination, consumer products, fiduciary services, private banking, retirement services, investment management and advisory services, investment banking services, brokerage services, the sale of annuity products, and the sale of life, disability and long-term care insurance products. Comerica competes in terms of products and pricing with large national and regional financial institutions and with smaller financial institutions. Some of Comerica's larger competitors, including certain nationwide banks that have a significant presence in Comerica's market area, may make available to their customers a broader array of product, pricing and structure alternatives and, due to their asset size, may more easily absorb credit losses in a larger overall portfolio. Some of Comerica's competitors (larger or smaller) may have more liberal lending policies and processes. Further, Comerica's banking competitors may be subject to a significantly different or reduced degree of regulation due to their asset size or types of products offered. They may also have the ability to more efficiently utilize resources to comply with regulations or may be able to more effectively absorb the costs of regulations into their existing cost structure. Comerica believes that the level of competition in all geographic markets will continue to increase in the future. competition. Because non-banking financial institutions are not subject to many of the same regulatory restrictions as banks and bank holding companies, they can often operate with greater flexibility and lower cost structures. Banks, bank holding companies, and financial institutions are highly regulated at both the state and federal level. Comerica is subject to supervision and regulation at the federal level by the Board of Governors of the Federal Reserve System (“FRB”) under the Bank Holding Company Act of 1956, as amended. The Gramm-Leach-Bliley Act expanded the activities in which a bank holding company registered as a financial holding company can engage. The conditions to be a financial holding company include, among others, the requirement that each depository institution subsidiary of the holding company be well capitalized and well managed. Effective July 2011, the Dodd-Frank Wall Street Reform and Consumer Protection Act (the “Dodd-Frank Act”) also requires the well capitalized and well managed standards to be met at the financial holding company level. Comerica became a financial holding company in 2000. As a financial holding company, Comerica may affiliate with securities firms and insurance companies, and engage in activities that are financial in nature. Activities that are “financial in nature” include, but are not limited to: securities underwriting; securities dealing and market making; sponsoring mutual funds and investment companies (subject to regulatory requirements, including restrictions set forth in the Volcker Rule, described under the heading "The Dodd-Frank Wall Street Reform and Consumer Protection Act and Recent Legislative and Regulatory Developments" below); insurance underwriting and agency; merchant banking; and activities that the FRB has determined to be financial in nature or incidental or complementary to a financial activity, provided that it does not pose a substantial risk to the safety or soundness of the depository institution or the financial system generally. A bank holding company that is not also a financial holding company is limited to engaging in banking and other activities previously determined by the FRB to be closely related to banking. Comerica Bank is chartered by the State of Texas and at the state level is supervised and regulated by the Texas Department of Banking under the Texas Finance Code. Comerica Bank has elected to be a member of the Federal Reserve System under the Federal Reserve Act and, consequently, is supervised and regulated by the Federal Reserve Bank of Dallas. Comerica Bank & Trust, National Association is chartered under federal law and is subject to supervision and regulation by the Office of the Comptroller of the Currency (“OCC”) under the National Bank Act. Comerica Bank & Trust, National Association, by virtue of being a national bank, is also a member of the Federal Reserve System. The deposits of Comerica Bank and Comerica Bank & Trust, National Association are insured by the Deposit Insurance Fund of the Federal Deposit Insurance Corporation (“FDIC”) to the extent provided by law. Certain transactions executed by Comerica Bank are also subject to regulation by the U.S. Commodity Futures Trading Commission. In Canada, Comerica Bank is supervised by the Office of the Superintendent of Financial Institutions and in Mexico, by the Banco de México. The FRB supervises non-banking activities conducted by companies directly and indirectly owned by Comerica. In addition, Comerica's non-banking subsidiaries are subject to supervision and regulation by various state, federal and self-regulatory agencies, including, but not limited to, the Financial Industry Regulatory Authority, Inc. (in the case of Comerica Securities, Inc.), the Department of Insurance and Financial Services of the State of Michigan (in the case of Comerica Insurance Services, Inc.), the Department of Licensing and Regulatory Affairs (in the case of Comerica Securities, Inc.) and the Securities and Exchange Commission (“SEC”) (in the case of Comerica Securities, Inc. and World Asset Management, Inc.). Various governmental requirements, including Sections 23A and 23B of the Federal Reserve Act and the FRB's Regulation W, limit borrowings by Comerica and its nonbank subsidiaries from its affiliate insured depository institutions, and also limit various other transactions between Comerica and its nonbank subsidiaries, on the one hand, and Comerica's affiliate insured depository institutions, on the other. For example, Section 23A of the Federal Reserve Act limits the aggregate outstanding amount of any insured depository institution's loans and other “covered transactions” with any particular nonbank affiliate to no more than 10% of the institution's total capital and limits the aggregate outstanding amount of any insured depository institution's covered transactions with all of its nonbank affiliates to no more than 20% of its total capital. “Covered transactions” are defined by statute to include a loan or extension of credit, as well as a purchase of securities issued by an affiliate, a purchase of assets (unless otherwise exempted by the FRB) from the affiliate, the acceptance of securities issued by the affiliate as collateral for a loan, and the issuance of a guarantee, acceptance or letter of credit on behalf of an affiliate. Section 23A of the Federal Reserve Act also generally requires that an insured depository institution's loans to its nonbank affiliates be, at a minimum, 100% secured, and Section 23B of the Federal Reserve Act generally requires that an insured depository institution's transactions with its nonbank affiliates be on terms and under circumstances that are substantially the same or at least as favorable as those prevailing for comparable transactions with nonaffiliates. The Dodd-Frank Act applied the 10% of capital limit on covered transactions to financial subsidiaries and amended the definition of “covered transaction” to include (i) securities borrowing or lending transactions with an affiliate, and (ii) all derivatives transactions with an affiliate, to the extent that either causes a bank or its affiliate to have credit exposure to the securities borrowing/lending or derivative counterparty. Dodd-Frank Act expanded the de novo interstate branching authority of banks beyond what had been permitted under the Interstate Act by eliminating the requirement that a state expressly “opt-in” to de novo branching, in favor of a rule that de novo interstate branching is permissible if under the law of the state in which the branch is to be located, a state bank chartered by that state would be permitted to establish the branch. The Dodd-Frank Act also requires that a bank holding company or bank be well capitalized and well managed (rather than simply adequately capitalized and adequately managed) in order to take advantage of these interstate banking and branching provisions. Comerica has consolidated the majority of its banking business into one bank, Comerica Bank, with banking centers in Texas, Arizona, California, Florida and Michigan, as well as Canada. Comerica Bank and Comerica Bank & Trust, National Association are required by federal law to obtain the prior approval of the FRB and/or the OCC, as the case may be, for the declaration and payment of dividends, if the total of all dividends declared by the board of directors of such bank in any calendar year will exceed the total of (i) such bank's retained net income (as defined and interpreted by regulation) for that year plus (ii) the retained net income (as defined and interpreted by regulation) for the preceding two years, less any required transfers to surplus or to fund the retirement of preferred stock. At January 1, 2017, Comerica's subsidiary banks could declare aggregate dividends of approximately $142 million from retained net profits of the preceding two years. Comerica's subsidiary banks declared dividends of $545 million in 2016, $437 million in 2015 and $380 million in 2014. Additionally, the payment of dividends by Comerica to its shareholders is subject to the non-objection of the FRB pursuant to the Comprehensive Capital Analysis and Review (CCAR) program. For more information, please see “The Dodd-Frank Wall Street Reform and Consumer Protection Act and Recent Legislative and Regulatory Developments” in this section. FDICIA requires, among other things, the federal banking agencies to take “prompt corrective action” in respect of depository institutions that do not meet minimum capital requirements. FDICIA establishes five capital tiers: “well capitalized,” “adequately capitalized,” “undercapitalized,” “significantly undercapitalized” and “critically undercapitalized.” A depository institution's capital tier will depend upon where its capital levels are in relation to various relevant capital measures, which, among others, include a Tier 1 and total risk-based capital measure and a leverage ratio capital measure. Regulations establishing the specific capital tiers provide that, for a depository institution to be well capitalized, it must have a total risk-based capital ratio of at least 10% and a Tier 1 risk-based capital ratio of at least 8%, a common equity Tier 1 risk-based capital measure of at least 6.5%, a Tier 1 leverage ratio of at least 5% and not be subject to any specific capital order or directive. For an institution to be adequately capitalized, it must have a total risk-based capital ratio of at least 8%, a Tier 1 risk-based capital ratio of at least 6%, a common equity Tier 1 risk-based capital measure of at least 4.5% and a Tier 1 leverage ratio of at least 4%. Under certain circumstances, the appropriate banking agency may treat a well capitalized, adequately capitalized or undercapitalized institution as if the institution were in the next lower capital category. As of December 31, 2016, Comerica and its banking subsidiaries exceeded the ratios required for an institution to be considered “well capitalized” under these regulations. For this purpose, a depository institution's or holding company's assets and certain specified off-balance sheet commitments are assigned to various risk categories defined by the FRB, each weighted differently based on the level of credit risk that is ascribed to such assets or commitments, based on counterparty type and asset class. A depository institution's or holding company's capital, in turn, is divided into three tiers: Common Equity Tier 1 (“CET1”), additional Tier 1, and Tier 2. CET1 capital predominantly includes common shareholders’ equity, less certain deductions for goodwill, intangible assets and deferred tax assets that arise from net operating losses and tax credit carry-forwards, if any. Additional Tier 1 capital primarily includes any outstanding noncumulative perpetual preferred stock and related surplus. Comerica has also made the election to permanently exclude accumulated other comprehensive income related to debt securities, cash flow hedges, and defined benefit postretirement plans from CET1 capital. Tier 2 capital primarily includes qualifying subordinated debt and qualifying allowance for credit losses. Certain deductions and adjustments to CET1 capital, Tier 1 capital and Tier 2 capital are subject to phase-in through December 31, 2017. Entities that engage in trading activities, whose trading activities exceed specified levels, also are required to maintain capital for market risk. Market risk includes changes in the market value of trading account, foreign exchange, and commodity positions, whether resulting from broad market movements (such as changes in the general level of interest rates, equity prices, foreign exchange rates, or commodity prices) or from position specific factors. From time to time, Comerica's trading activities may exceed specified regulatory levels, in which case Comerica maintains additional capital for market risk as required. Comerica, like other bank holding companies, currently is required to maintain CET1, Tier 1 (the sum of CET1 and additional Tier 1 capital) and “total capital” (the sum of Tier 1 and Tier 2 capital) equal to at least 4.5%, 6% and 8% of its total risk-weighted assets (including certain off-balance-sheet items, such as standby letters of credit), respectively. In 2016, Comerica was also required to maintain a minimum capital conservation buffer of 0.625% in order to avoid restrictions on capital distributions and discretionary bonuses. The minimum required capital conservation buffer gradually increases to 2.5% in 2019. At December 31, 2016, Comerica met all requirements, with CET1, Tier 1 and total capital equal to 11.09%, 11.09% and 13.27% of its total risk-weighted assets, respectively, and a capital conservation buffer of 5.09% of its total risk-weighted assets. 10.51% and 12.40% of its total risk-weighted assets, respectively, a capital conservation buffer of 4.40% of its total risk-weighted assets, and a leverage ratio of 9.65%. Additional information on the calculation of Comerica and its bank subsidiaries' CET1, Tier 1 capital, total capital and risk-weighted assets is set forth in Note 20 of the Notes to Consolidated Financial Statements located on pages F-99 through F-100 of the Financial Section of this report. Additional information on the timing and nature of the Basel III capital requirements is set forth below, under "Basel III: Regulatory Capital and Liquidity Regime." The FDIC Deposit Insurance Fund (“DIF”) provides insurance coverage for certain deposits. Comerica's subsidiary banks are subject to FDIC deposit insurance assessments to maintain the DIF. The FDIC imposes a risk-based deposit premium assessment system, which was amended pursuant to the Federal Deposit Insurance Reform Act of 2005 and further amended by the Dodd-Frank Act. The Dodd-Frank Act also increased the DIF's minimum reserve ratio and permanently increased general deposit insurance coverage from $100,000 to $250,000. Under the risk-based deposit premium assessment system, the assessment rates for an insured depository institution are determined by an assessment rate calculator, which is based on a number of elements to measure the risk each institution poses to the DIF. The assessment rate is applied to total average assets less tangible equity. Under the current system, premiums are assessed quarterly and could increase if, for example, criticized loans and/or other higher risk assets increase or balance sheet liquidity decreases. For 2016, Comerica’s FDIC insurance expense totaled $54 million, including the surcharge described below. Effective July 1, 2016, the FDIC issued a final rule in order to implement section 334 of the Dodd-Frank Act (§334), which requires the FDIC to (1) raise the minimum reserve ratio for the DIF to 1.35 percent, from 1.15 percent, (2) assess premiums on banks to reach the 1.35 percent goal by September 30, 2020, and (3) offset the effect of the increase in the minimum reserve ratio on insured depository institutions with assets of less than $10 billion. The final rule imposes a surcharge on large banks, to be assessed over a period of eight quarters, as a means to implement §334. Comerica is subject to the surcharge assessment. If this surcharge is insufficient to increase the reserve ratio to 1.35 percent by December 31, 2018, a one-time shortfall assessment will be imposed on institutions with total consolidated assets of $10 billion or more on March 31, 2019. Management currently estimates that, based on the final rule, FDIC expense will increase by a total of approximately $20 million over the eight-quarter period that began July 1, 2016. The financial crisis led to significant changes in the legislative and regulatory landscape of the financial services industry, including the overhaul of that landscape with the passage of the Dodd-Frank Act, which was signed into law on July 21, 2010. Provided below is an overview of key elements of the Dodd-Frank Act relevant to Comerica, as well as recent legislative and regulatory developments. The estimates of the impact on Comerica discussed below are based on information currently available and, if applicable, are subject to change until final rulemaking is complete. individuals covered by each plan and the risks inherent in each plan’s design and implementation. Comerica has determined that risks arising from employee compensation plans are not reasonably likely to have a material adverse effect on Comerica. Further, it is the Company’s intent to continue to evolve our processes going forward by monitoring regulations and best practices for sound incentive compensation. In 2016, the FRB, OCC and several other federal financial regulators revised and re-proposed rules to implement Section 956 of the Dodd-Frank Act. The rules were first proposed in 2011. Section 956 directed regulators to jointly prescribe regulations or guidelines prohibiting incentive-based payment arrangements, or any feature of any such arrangement, at covered financial institutions that encourage inappropriate risks by providing excessive compensation or that could lead to a material financial loss. This proposal supplements the final guidance issued by the banking agencies in June 2010. Consistent with the Dodd-Frank Act, the proposed rule would not apply to institutions with total consolidated assets of less than $1 billion, and would impose heightened standards for institutions with $50 billion or more in total consolidated assets, which includes Comerica. For these larger institutions, the proposed rule would require the deferral of at least 40 percent of incentive-based payments for designated executives and significant risk-takers who individually have the ability to expose the institution to possible losses that are substantial in relation to the institution's size, capital or overall risk tolerance. Moreover, incentive-based compensation of these individuals would be subject to potential clawback for seven years following vesting. Further, the rule imposes enhanced risk management controls and governance and internal policy and procedure requirements with respect to incentive compensation. Comerica is monitoring the development of this rule. Basel III: Regulatory Capital and Liquidity Regime. In December 2010, the Basel Committee on Banking Supervision (the “Basel Committee”) issued a framework for strengthening international capital and liquidity regulation (“Basel III”). In July 2013, U.S. banking regulators issued a final rule for the U.S. adoption of the Basel III regulatory capital framework. Basel III includes a more stringent definition of capital and introduces a new common equity Tier 1 ("CET1") capital requirement; sets forth two comprehensive methodologies for calculating risk-weighted assets ("RWA"), a standardized approach and an advanced approach; introduces two new capital buffers, a conservation buffer and a countercyclical buffer (applicable to advanced approach entities); establishes a new supplemental leverage ratio (applicable to advanced approach entities); and sets out minimum capital ratios and overall capital adequacy standards. As a banking organization subject to the standardized approach, the rules were effective for Comerica on January 1, 2015. Certain deductions and adjustments to regulatory capital (primarily related to intangible assets and surplus Tier 2 capital minority interest) phase in and will be fully implemented on January 1, 2018. The capital conservation buffer phases in at 0.625 percent beginning on January 1, 2016 and ultimately increases to 2.5 percent on January 1, 2019. Comerica is not subject to the countercyclical buffer or the supplemental leverage ratio. Comerica's December 31, 2016 CET1 and Tier 1 ratios were both 11.09 percent. Comerica's December 31, 2016 CET1 and Tier 1 capital ratios exceed the minimum required by the final rule (4.5 percent and 6 percent, respectively). On September 3, 2014, U.S. banking regulators adopted the Liquidity Coverage Ratio ("LCR") rule, which set for U.S. banks the minimum liquidity measure established under the Basel III liquidity framework. Under the final rule, Comerica is subject to a modified LCR standard, which requires a financial institution to hold a minimum level of high-quality, liquid assets ("HQLA") to fully cover modified net cash outflows under a 30-day systematic liquidity stress scenario. The rule was effective for Comerica on January 1, 2016. During the transition year, 2016, Comerica was required to maintain a minimum LCR of 90 percent. Beginning January 1, 2017, and thereafter, the minimum required LCR will be 100 percent. At each quarter-end in 2016, Comerica was in compliance with the fully phased-in LCR requirement, plus a buffer. In the second quarter 2016, U.S. banking regulators issued a notice of proposed rulemaking (the proposed rule) implementing a second quantitative liquidity requirement in the U.S. generally consistent with the Net Stable Funding Ratio (NSFR) minimum liquidity measure established under the Basel III liquidity framework. Under the proposed rule, Comerica will be subject to a modified NSFR standard effective January 1, 2018, which requires a financial institution to hold a minimum level of available longer-term, stable sources of funding to fully cover a modified amount of required longer-term stable funding, over a one-year period. Comerica does not currently expect the proposed rule to have a material impact on its liquidity needs. Interchange Fees. On July 20, 2011, the FRB published final rules (Regulation II) pursuant to the Dodd-Frank Act establishing the maximum permissible interchange fee that an issuer may receive for an electronic debit transaction as the sum of 21 cents per transaction and 5 basis points multiplied by the value of the transaction and prohibiting network exclusivity arrangements and routing restrictions. Comerica is subject to the final rules. Supervision and Regulation Assessment. Section 318 of the Dodd-Frank Act authorizes the federal banking agencies to assess fees against bank holding companies with total consolidated assets in excess of $50 billion equal to the expenses necessary or appropriate in order to carry out their supervision and regulation of those companies. Comerica expensed $1.9 million for 2016, which will be assessed in the first quarter 2017.
a multi-faceted approach to implementing the Volcker Rule prohibitions that relies on: (i) detailed descriptions of prohibited and permitted activities; (ii) detailed compliance requirements; and (iii) for banking entities with large volumes of trading activity, detailed quantitative analysis and reporting obligations. In addition to rules implementing the core prohibitions and exemptions (e.g. underwriting, market-making related activities, risk-mitigating hedging and trading in certain government obligations) of the Volcker Rule, the regulations also include two appendices devoted to record-keeping and reporting requirements, including numerous quantitative data reporting obligations for banking entities with significant trading activities (Appendix A) and enhanced compliance requirements for banking entities with significant trading or covered fund activities (Appendix B). The final rule was effective April 1, 2014. The Volcker Rule generally required full compliance with the new restrictions by July 21, 2015; however, the FRB has extended the conformance period to July 21, 2017 for covered funds that were in place prior to December 31, 2013. Comerica is currently in compliance with the effective aspect of the Volcker Rule and expects to meet the final requirements adopted by regulators within the applicable regulatory timelines. Additional information on Comerica's portfolio of indirect (through funds) private equity and venture capital investments is set forth in Note 1 of the Notes to Consolidated Financial Statements located on page F-52 of the Financial Section of this report. Annual Capital Plans and Stress Tests. Comerica is subject to the FRB’s annual Comprehensive Capital Analysis and Review (CCAR) process, as well as the Dodd-Frank Act Stress Testing (DFAST) requirements. As part of the CCAR process, the FRB undertakes a supervisory assessment of the capital adequacy of bank holding companies (BHCs), including Comerica, that have $50 billion or more in total consolidated assets. This capital adequacy assessment is based on a review of a comprehensive capital plan submitted by each participating BHC to the FRB that describes the company’s planned capital actions during the nine quarter review period, as well as the results of stress tests conducted by both the company and the FRB under different hypothetical macro-economic scenarios, including a supervisory baseline and an adverse and a severely adverse scenario provided by the FRB. The FRB reviews both quantitative factors (such as projected capital ratios under a hypothetical stress scenario) and qualitative factors (such as the strength of the company's capital planning process). On January 30, 2017, the FRB issued a final rule stating that going forward, large and noncomplex firms, such as Comerica, would remain subject to a quantitative assessment in CCAR, but would no longer be subject to the qualitative assessment as part of CCAR; instead, the qualitative assessment would be conducted through the regular ongoing supervisory review process. After completing its review, the FRB may object or not object to the company’s proposed capital actions, such as plans to pay or increase common stock dividends, reinstate or increase common equity repurchase programs, or issue or redeem preferred stock or other regulatory capital instruments. In connection with the 2016 CCAR, Comerica submitted its 2016 capital plan to the FRB on April 4, 2016; on June 23, 2016, Comerica and the FRB released the revenue, loss and capital results from the annual stress testing exercises and on June 29, 2016, Comerica announced that the FRB had completed its CCAR 2016 capital plan review and did not object to the capital plan or capital distributions contemplated in the plan for the four-quarter period commencing in the third quarter 2016 and ending in the second quarter 2017. Comerica plans to submit its CCAR 2017 capital plan to the FRB, consistent with supervisory guidance (SR 15-19), in April 2017 and expects to receive the results of the FRB's review of the plan in June 2017 and to release its company-run stress tests results in June or July 2017. FRB regulations also required that Comerica and other large bank holding companies conduct a separate mid-year stress test using financial data as of June 30th and three company-derived macro-economic scenarios (base, adverse and severely adverse) and publish a summary of the results under the severely adverse scenario. On October 20, 2016, Comerica released the results of its company-run mid-year stress tests. Stress test results are available in the Investor Relations section of Comerica's website at investor.comerica.com, on the “Regulatory Disclosures” page under "Financial Reports." On February 18, 2014, the FRB issued its final regulations to implement the enhanced prudential and supervisory requirements mandated by the Dodd-Frank Act. The final regulations address enhanced risk-based capital and leverage requirements, enhanced liquidity requirements, enhanced risk management and risk committee requirements, single-counterparty credit limits, semiannual stress tests (as described above under "Annual Capital Plans and Stress Tests"), and a debt-to-equity limit for companies determined to pose a grave threat to financial stability. They are intended to allow regulators to more effectively supervise large bank holding companies and nonbank financial firms whose failure could impact the stability of the US financial system, and generally build on existing US and international regulatory guidance. The rule also takes a multi-stage or phased approach to many of the requirements (such as the capital and liquidity requirements). Most of these requirements apply to Comerica because it has consolidated assets of more than $50 billion. Comerica has or will implement all requirements of the new rules within regulatory timelines. and FDIC) a plan for their rapid and orderly resolution under the U.S. Bankruptcy Code. Covered companies, such as Comerica, with less than $100 billion in total nonbank assets were required to submit their initial plans by December 31, 2013. In addition, Section 165(d) requires FDIC-insured depository institutions (like Comerica Bank) with assets of $50 billion or more to develop, maintain, and periodically submit plans outlining how the FDIC would resolve it through the FDIC's resolution powers under the Federal Deposit Insurance Act. The federal banking agencies have issued rules to implement these requirements. In addition, those rules require the filing of annual updates to the plans. Both Comerica and Comerica Bank filed their respective initial and updated resolution plans by the required due dates, and will submit their 2017 resolution plans prior to December 31, 2017. Section 611 and Title VII of the Dodd-Frank Act. Section 611 of the Dodd-Frank Act prohibits a state bank from engaging in derivative transactions unless the lending limit laws of the state in which the bank is chartered take into consideration exposure to derivatives. Section 611 does not provide how state lending limit laws must factor in derivatives. The Texas Finance Commission has adopted an administrative rule meeting the requirements of Section 611. Comerica Bank's policy is designed to comply with the Texas rule. Accordingly, Comerica Bank may engage in derivative transactions, as permitted by applicable law. On October 13, 2016, the CFTC issued an Order setting the de minimis threshold at $8 billion through December 31, 2018 with respect to the de minimis exception to the swap dealer definition. In taking this action, the de minimis threshold will not decrease to $3 billion on December 31, 2017, as initially proposed. At this time, Comerica will continue to track its dealing activity. The variation margin requirements for non-centrally cleared swaps and security-based swaps are effective for Comerica on March 31, 2017. The variation margin requirements were issued for the purpose of ensuring safety and soundness of swap trading in light of the risk to the financial system associated with non-cleared swaps activity. Comerica is currently working toward meeting compliance with the variation margin requirements. The foreign remittance rules fall under Section 1073 of the Dodd-Frank Act. The CFPB issued new regulations amending Regulation E, which implements the Electronic Fund Transfer Act, effective October 28, 2013. The regulations were designed to provide protections to consumers who transfer funds to recipients located in countries outside the United States (customer foreign remittance transfers). In general, the regulation requires remittance transfer providers, such as Comerica, to disclose to a consumer the exchange rate, fees, and amount to be received by the recipient when the consumer sends a remittance transfer. Although Comerica had implemented the model disclosures provided in Appendix A to the final rule, on September 18, 2014, the CFPB extended the compliance exception period for the rule's new disclosure requirements to July 21, 2020. On October 5, 2016, effective October 1, 2017, the CFPB issued final regulations establishing new consumer protections and disclosure requirements on prepaid accounts. The final rule’s definition of prepaid accounts specifically includes payroll card accounts and government benefit accounts. It also includes cards that are not linked to a deposit account to conduct person-to- person (P2P) transfers. The regulations include (i) the provision of either periodic statements or free online account information access; (ii) new account error and unauthorized transaction rights; (iii) new “Know Before You Choose” prepaid account disclosures; (iv) public disclosure of account agreements for prepaid accounts and (v) credit protection for linked credit accounts. Additionally, the final rule regulates overdraft credit features that may be offered in conjunction with prepaid accounts. Comerica has positioned itself to be in compliance with the new requirements. changes in TRID include: (1) expansion of the scope of loans that require RESPA early disclosures, including bridge loans, vacant land loans, and construction loans; (2) changes and additions to “waiting period” requirements to close a loan; (3) reduced tolerances for estimated fees and (4) the lender, rather than the closing agent, is responsible for providing final disclosures. Although Comerica outsources most of its consumer mortgage loans, consumer construction financing has been suspended. This regulation has also resulted in a suspension of consumer bridge loan financing. Such financing has not been a significant business for Comerica. Home Mortgage Disclosure Act (HMDA), Equal Credit Opportunity Act (ECOA) and Uniform Residential Loan Application (URLA). A revised and redesigned URLA was approved by the CFPB on September 23, 2016. The official approval expands the Home Mortgage Disclosure Act information about Ethnicity and Race that can be collected from January 1, 2017 through December 31, 2017. Regulation C, as amended by the final rule published in the Federal Register at 80 FR 66127 on October 28, 2015 (2015 HMDA final rule), will require financial institutions to permit applicants to self-identify using disaggregated ethnic and racial categories beginning January 1, 2018 in conformance with the 2016 URLA. Most consumer-purpose transactions, including closed-end home-equity loans, home-equity lines of credit and reverse mortgages, are subject to the regulation. Most commercial-purpose transactions (i.e., loans or lines of credit not for personal, family, or household purposes) are subject to the regulation only if they are for the purpose of home purchase, home improvement, or refinancing. The final rule excludes from coverage home improvement loans that are not secured by a dwelling (i.e., home improvement loans that are unsecured or that are secured by some other type of collateral) and all agricultural-purpose loans and lines of credit. Comerica is monitoring and implementing changes as required. FDIC Guidance on Brokered Deposits. On January 5, 2015, the FDIC issued guidance in the form of “Frequently Asked Questions” to promote consistency by insured depository institutions in identifying, accepting, and reporting brokered deposits. On November 13, 2015, the FDIC issued proposed updates to the FAQs. All insured depository institutions (including those that are well capitalized) must report brokered deposits in their Consolidated Reports of Condition and Income (Call Reports). Comerica has evaluated the impact of these FAQs, including the proposed updates, to various business units throughout the organization. The FAQs had only a nominal impact. Flood Insurance Reform. The Biggert-Waters Flood Insurance Reform Act of 2012 (“Biggert-Waters Act”), as amended by the Homeowner Flood Insurance Affordability Act of 2014, modified the National Flood Insurance Program by: (i) increasing the maximum civil penalty for Flood Disaster Protection Act violations to $2,000 and eliminating the annual penalty cap; (ii) requiring certain lenders (including Comerica) to escrow premiums and fees for flood insurance on residential improved real estate; (iii) directing lenders to accept private flood insurance and to notify borrowers of its availability; (iv) amending the force placement requirement provisions; and (v) permitting lenders to charge borrowers costs for lapses in or insufficient coverage. These requirements will impact Comerica loans and extensions of credit secured with residential improved real estate. The civil penalty and force placed insurance provisions were effective immediately. The escrow provisions became effective on January 1, 2016. On October 31, 2016, the federal agencies issued a Joint Notice of Proposed Rulemaking concerning the private flood insurance rules with request for additional public comments due on January 6, 2017. Comerica will continue to monitor the development and implementation of the private flood insurance rules. The environment in which financial institutions have operated since the financial crisis, including legislative and regulatory changes affecting capital, liquidity, supervision, permissible activities, corporate governance and compensation, and changes in fiscal policy, may have long-term effects on the business model and profitability of financial institutions that cannot be foreseen. Further, it is too soon for Comerica to predict what legislative or regulatory changes may occur as a result of the recent change in the U.S. presidential administration, or, if changes occur, the ultimate effect they would have upon the financial condition or results of operations of Comerica. For additional information specific to our Energy loan portfolio, please see the caption, “Energy Lending” on pages F-30 through F-31 of the Financial Section of this report. Comerica's CRE loan portfolio consists of real estate construction and commercial mortgage loans and includes both loans to real estate developers and loans secured by owner-occupied real estate. Comerica's CRE loan underwriting policies are consistent with the approach described above and provide maximum loan-to-value ratios that limit the size of a loan to a maximum percentage of the value of the real estate collateral securing the loan. The loan-to-value percentage varies by the type of collateral and is limited by advance rates established by our regulators. Our loan-to-value limitations are, in certain cases, more restrictive than those required by regulators and are influenced by other risk factors such as the financial strength of the borrower or guarantor, the equity provided to the project and the viability of the project itself. CRE loans generally require cash equity. CRE loans are normally originated with full recourse or limited recourse to all principals and owners. There are limitations to the size of a single project loan and to the aggregate dollar exposure to a single guarantor. Comerica's consumer and residential mortgage loans are originated consistent with the underwriting approach described above, but also includes an assessment of each borrower's personal financial condition, including a review of credit reports and related FICO scores (a type of credit score used to assess an applicant's credit risk) and verification of income and assets. Comerica does not originate subprime loans. Although a standard industry definition for subprime loans (including subprime mortgage loans) does not exist, Comerica defines subprime loans as specific product offerings for higher risk borrowers, including individuals with one or a combination of high credit risk factors. These credit factors include low FICO scores, poor patterns of payment history, high debt-to-income ratios and elevated loan-to-value. We generally consider subprime FICO scores to be those below 620 on a secured basis (excluding loans with cash or near-cash collateral and adequate income to make payments) and below 660 for unsecured loans. Residential mortgage loans retained in the portfolio are largely relationship based. The remaining loans are typically eligible to be sold on the secondary market. Adjustable rate loans are limited to standard conventional loan programs. As of December 31, 2016, Comerica and its subsidiaries had 7,659 full-time and 490 part-time employees. In addition, pursuant to regulations adopted by the FRB, Comerica makes additional regulatory capital-related disclosures. Under these regulations, Comerica satisfies a portion of these requirements through postings on its website, and Comerica has done so and expects to continue to do so without also providing disclosure of this information through filings with the SEC. This report includes forward-looking statements as defined in the Private Securities Litigation Reform Act of 1995. In addition, Comerica may make other written and oral communications from time to time that contain such statements. All statements regarding Comerica's expected financial position, strategies and growth prospects and general economic conditions Comerica expects to exist in the future are forward-looking statements. The words, “anticipates,” “believes,” “contemplates,” “feels,” “expects,” “estimates,” “seeks,” “strives,” “plans,” “intends,” “outlook,” “forecast,” “position,” “target,” “mission,” “assume,” “achievable,” “potential,” “strategy,” “goal,” “aspiration,” "opportunity," "initiative," “outcome,” “continue,” “remain,” “maintain,” "on course," “trend,” “objective,” "looks forward," "projects," "models" and variations of such words and similar expressions, or future or conditional verbs such as “will,” “would,” “should,” “could,” “might,” “can,” “may” or similar expressions, as they relate to Comerica or its management, are intended to identify forward-looking statements. In addition to factors mentioned elsewhere in this report or previously disclosed in Comerica's SEC reports (accessible on the SEC's website at www.sec.gov or on Comerica's website at www.comerica.com), the factors contained below, among others, could cause actual results to differ materially from forward-looking statements, and future results could differ materially from historical performance. state and local municipal budget deficits, government spending and the U.S. national debt, outside of our control may, directly and indirectly, adversely affect Comerica. Proposed revenue enhancements and efficiency improvements may not be achieved. In July 2016 Comerica announced the implementation of its efficiency and revenue initiative, GEAR Up (the "initiative") and related financial targets. There may be changes in the scope or assumptions underlying the initiative, delays in the anticipated timing of activities related to the initiative and higher than expected or unanticipated costs to implement them, and some benefits may not be fully achieved. As well, even if the initiative is successful, many factors can influence the amount of core noninterest expenses, some of which are not wholly in our control, including changing regulations, benefits and health care costs, technology and cybersecurity investments, outside processing expenses and litigation. Furthermore, the implementation of the initiative may have unintended impacts on Comerica's ability to attract and retain business, customers and employees, and could result in disruptions to systems, processes, controls and procedures. Any revenue enhancement ideas may not be successful in the marketplace. Accordingly, Comerica's results of operations and profitability may be negatively impacted, making it less competitive and potentially causing a loss of market share. Additionally, Comerica's future performance is subject to the various risks inherent to its business and operations. In September 2014, U.S. banking regulators issued a final rule implementing a quantitative liquidity requirement in the U.S. generally consistent with the Liquidity Coverage Ratio ("LCR") minimum liquidity measure established under the Basel III liquidity framework. Under the final rule, Comerica is subject to a modified LCR standard, which requires a financial institution to hold a minimum level of high-quality, liquid assets to fully cover modified net cash outflows under a 30-day systematic liquidity stress scenario. The rule was effective for Comerica on January 1, 2016. During the transition year, 2016, Comerica was required to maintain a minimum LCR of 90 percent. Beginning January 1, 2017, and thereafter, the minimum required LCR will be 100 percent. For more information regarding the LCR, please see the “Supervision and Regulation” section of this report. The inability to access capital markets funding sources as needed could adversely impact our level of regulatory-qualifying capital and ability to continue to comply with the LCR framework. Further, if Comerica is unable to continue to fund assets through customer bank deposits or access funding sources on favorable terms, or if Comerica suffers an increase in borrowing costs or otherwise fails to manage liquidity effectively, Comerica’s liquidity, operating margins, financial condition and results of operations may be materially adversely affected. Comerica is required to satisfy stringent capital and liquidity standards, including annual and mid-year stress testing and quantitative standards for liquidity management, as a result of capital and liquidity requirements in connection with Basel III and the Dodd-Frank Act. Additional information on the regulatory capital and liquidity requirements currently applicable to Comerica is set forth in the “Supervision and Regulation” section of this report. These requirements, and any other new laws or regulations related to capital and liquidity, could adversely affect Comerica's ability to pay dividends or make equity repurchases, or could require Comerica to reduce business levels or to raise capital, including in ways that may adversely affect its results of operations or financial condition and/or existing shareholders. Further, our regulators may also require us to satisfy additional, more stringent capital adequacy and liquidity standards than those specified as part of the Dodd-Frank Act and the FRB's rules implementing Basel III. Maintaining higher levels of capital and liquidity may reduce Comerica's profitability and otherwise adversely affect its business, financial condition, or results of operations. Declines in the businesses or industries of Comerica's customers - in particular, the energy industry - could cause increased credit losses or decreased loan balances, which could adversely affect Comerica. Comerica's business customer base consists, in part, of customers in volatile businesses and industries such as the energy industry, the automotive production industry and the real estate business. These industries are sensitive to global economic conditions, supply chain factors and/or commodities prices. Any decline in one of those customers' businesses or industries could cause increased credit losses, which in turn could adversely affect Comerica. Further, any decline in these businesses or industries could cause decreased borrowings, either due to reduced demand or reductions in the borrowing base available for each customer loan. In particular, oil and gas prices have remained at lower levels since mid-2014. Loans in the Energy business line were $2.3 billion, or less than 5 percent of total loans, at December 31, 2016. If oil and gas prices become further depressed and remain depressed for an extended period of time, Comerica's energy portfolio could experience increased credit losses, which could adversely affect Comerica's financial results. Additionally, a prolonged period of further decreased oil prices could also have a negative impact on the Texas economy, which could have a material adverse effect on Comerica’s business, financial condition and results of operations. For more information regarding Comerica's energy portfolio, please see “Energy Lending” beginning on page F-30 of the Financial Section of this report. Comerica may also be subject to disruptions of its operating systems arising from events that are wholly or partially beyond its control, which may include, for example, computer viruses, cyber attacks (including cyber attacks resulting in the destruction or exfiltration of data and systems), spikes in transaction volume and/or customer activity, electrical or telecommunications outages, or natural disasters. Although Comerica has programs in place related to business continuity, disaster recovery and information security to maintain the confidentiality, integrity, and availability of its systems, business applications and customer information, such disruptions may give rise to interruptions in service to customers and loss or liability to Comerica, including loss of customer data. Comerica has not experienced a cyber attack which resulted in a loss of client data. However, future cyber attacks could be more disruptive and damaging, and Comerica may not be able to anticipate or prevent all such attacks. •Changes in regulation or oversight may have a material adverse impact on Comerica's operations. Comerica is subject to extensive regulation, supervision and examination by the U.S. Treasury, the Texas Department of Banking, the FDIC, the FRB, the SEC, FINRA and other regulatory bodies. Such regulation and supervision governs the activities in which Comerica may engage. Regulatory authorities have extensive discretion in their supervisory and enforcement activities, including the imposition of restrictions on Comerica's operations, investigations and limitations related to Comerica's securities, the classification of Comerica's assets and determination of the level of Comerica's allowance for loan losses. Any change in such regulation and oversight, whether in the form of regulatory policy, regulations, legislation or supervisory action, may have a material adverse impact on Comerica's business, financial condition or results of operations. It is too soon for Comerica to predict what legislative or regulatory changes may occur as a result of the recent change in the U.S. presidential administration, or, if changes occur, the ultimate effect they would have upon the financial condition or results of operations of Comerica. The impact of any future legislation or regulatory actions may adversely affect Comerica's businesses or operations. Comerica faces the risk of operational disruption, failure or capacity constraints due to its dependency on third party vendors for components of its business infrastructure. Third party vendors provide certain key components of Comerica's business infrastructure, such as data processing and storage, payment processing services, recording and monitoring transactions, internet connections and network access, clearing agency and card processing services. While Comerica conducts due diligence prior to engaging with third party vendors, it does not control their operations. Further, while Comerica's vendor management policies and practices are designed to comply with current vendor regulations, these policies and practices cannot eliminate this risk. In this context, any vendor failure to properly deliver these services could adversely affect Comerica’s business operations, and result in financial loss, reputational harm, and/or regulatory action. The operations of financial institutions such as Comerica are dependent to a large degree on net interest income, which is the difference between interest income from loans and investments and interest expense on deposits and borrowings. Prevailing economic conditions, the trade, fiscal and monetary policies of the federal government and the policies of various regulatory agencies all affect market rates of interest and the availability and cost of credit, which in turn significantly affect financial institutions' net interest income and the market value of its investment securities. Interest rates over the past several years have remained at low levels, even following the Federal Open Market Committee's 25 basis point rate rises in December 2015 and 2016. A continued low interest rate environment may continue to adversely affect the interest income Comerica earns on loans and investments. For a discussion of Comerica's interest rate sensitivity, please see, “Market and Liquidity Risk” beginning on page F-32 of the Financial Section of this report. Reduction in our credit ratings could adversely affect Comerica and/or the holders of its securities. ratings below investment grade, it could also create obligations or liabilities under the terms of existing arrangements that could increase Comerica's costs under such arrangements. Additionally, a downgrade of the credit rating of any particular security issued by Comerica or its subsidiaries could negatively affect the ability of the holders of that security to sell the securities and the prices at which any such securities may be sold. Damage to Comerica’s reputation could damage its businesses. With consumers increasingly interested in doing business with companies they admire and trust, reputational risk is an increasing concern for business. Such risks include compliance issues, operational challenges, or a strategic, high profile event. Comerica's business is based on the trust of its customers, communities, and entire value chain, which makes managing reputational risk extremely important. News or other publicity that impairs Comerica's reputation, or the reputation of the financial services industry generally, can therefore cause significant harm to Comerica’s business and prospects. Further, adverse publicity or negative information posted on social media websites regarding Comerica, whether or not true, may result in harm to Comerica’s prospects. Comerica operates in a very competitive environment, which is characterized by competition from a number of other financial institutions in each market in which it operates. Comerica competes in terms of products and pricing with large national and regional financial institutions and with smaller financial institutions. Some of Comerica's larger competitors, including certain nationwide banks that have a significant presence in Comerica's market area, may make available to their customers a broader array of product, pricing and structure alternatives and, due to their asset size, may more easily absorb credit losses in a larger overall portfolio. Some of Comerica's competitors (larger or smaller) may have more liberal lending policies and processes. to their asset size or types of products offered. They may also have the ability to more efficiently utilize resources to comply with regulations or may be able to more effectively absorb the costs of regulations into their existing cost structure. Further, the assimilation of the acquired entity's customers and markets could result in higher than expected deposit attrition, loss of key employees, disruption of Comerica's businesses or the businesses of the acquired entity or otherwise adversely affect Comerica's ability to maintain relationships with customers and employees or achieve the anticipated benefits of the acquisition. These matters could have an adverse effect on Comerica for an undetermined period. Comerica will be subject to similar risks and difficulties in connection with any future decisions to downsize, sell or close units or otherwise change the business mix of Comerica. Further, Comerica's ability to retain key officers and employees may be impacted by legislation and regulation affecting the financial services industry. In 2016, the FRB, OCC and several other federal financial regulators revised and re-proposed rules to implement Section 956 of the Dodd-Frank Act. Section 956 directed regulators to jointly prescribe regulations or guidelines prohibiting incentive-based payment arrangements, or any feature of any such arrangement, at covered financial institutions that encourage inappropriate risks by providing excessive compensation or that could lead to a material financial loss. Consistent with the Dodd-Frank Act, the proposed rule would not apply to institutions with total consolidated assets of less than $1 billion, and would impose heightened standards for institutions with $50 billion or more in total consolidated assets, which includes Comerica. For these larger institutions, the proposed rule would require the deferral of at least 40 percent of incentive-based payments for designated executives and significant risk-takers who individually have the ability to expose the institution to possible losses that are substantial in relation to the institution's size, capital or overall risk tolerance. Moreover, incentive-based compensation of these individuals would be subject to potential clawback for seven years following vesting. Further, the rule imposes enhanced risk management controls and governance and internal policy and procedure requirements with respect to incentive compensation. Accordingly, Comerica may be at a disadvantage to offer competitive compensation compared to other financial institutions (as referenced above) or companies in other industries, which may not be subject to the same requirements. Instruments, systems and strategies used to hedge or otherwise manage exposure to various types of credit, market, liquidity, operational, compliance, financial reporting and strategic risks could be less effective than anticipated. As a result, Comerica may not be able to effectively mitigate its risk exposures in particular market environments or against particular types of risk, which could have a material adverse impact on Comerica's business, financial condition or results of operations. Comerica has significant operations and a significant customer base in California, Texas, Florida and other regions where natural and other disasters may occur. These regions are known for being vulnerable to natural disasters and other risks, such as tornadoes, hurricanes, earthquakes, fires, droughts and floods, the nature and severity of which may be impacted by climate change. These types of natural catastrophic events at times have disrupted the local economy, Comerica's business and customers and have posed physical risks to Comerica's property. In addition, catastrophic events occurring in other regions of the world may have an impact on Comerica's customers and in turn, on Comerica. A significant catastrophic event could materially adversely affect Comerica's operating results. The tax treatment of corporations could be subject to potential legislative, administrative or judicial changes or interpretations. The present federal income tax treatment of corporations may be modified by legislative, administrative or judicial changes or interpretations at any time. For example, the current administration has indicated it will propose reductions to the corporate statutory tax rate. A decline in the federal corporate tax rate may lower Comerica’s tax provision expense. However, it may also significantly decrease the value of Comerica’s deferred tax assets (“DTAs”), which would result in a reduction of net income in the period in which the tax change is enacted. At December 31, 2016, Comerica’s net DTAs were approximately $217 million. As well, if the President and Congress approve comprehensive tax reform, low-income housing tax credits (LIHTCs), New Markets Tax Credits (NMTCs), the beneficial tax treatment of bank-owned life insurance or other current tax positions taken by Comerica could be at risk. We are unable to predict whether any of these changes, or other proposals, will ultimately be enacted. Any such changes could adversely affect Comerica. Management has identified certain accounting policies as being critical because they require management's judgment to make difficult, subjective or complex judgments about matters that are uncertain. Materially different amounts could be reported under different conditions or using different assumptions or estimates. Comerica has established detailed policies and control procedures that are intended to ensure these critical accounting estimates and judgments are well controlled and applied consistently. In addition, the policies and procedures are intended to ensure that the process for changing methodologies occurs in an appropriate manner. Because of the uncertainty surrounding management's judgments and the estimates pertaining to these matters, Comerica cannot guarantee that it will not be required to adjust accounting policies or restate prior period financial statements. See “Critical Accounting Policies” on pages F-38 through F-41 of the Financial Section of this report and Note 1 of the Notes to Consolidated Financial Statements located on pages F-49 through F-61 of the Financial Section of this report. The executive offices of Comerica are located in the Comerica Bank Tower, 1717 Main Street, Dallas, Texas 75201. Comerica Bank occupies six floors of the building, plus additional space on the building's lower level. Comerica does not own the Comerica Bank Tower space, but has naming rights to the building and leases the space from an unaffiliated third party. The lease for such space used by Comerica and its subsidiaries extends through September 2023. Comerica's Michigan headquarters are located in a 10-story building in the central business district of Detroit, Michigan at 411 W. Lafayette, Detroit, Michigan 48226. Such building is owned by Comerica Bank. As of December 31, 2016, Comerica, through its banking affiliates, operated at a total of 591 locations. This includes banking centers, trust services locations, and/or loan production or other financial services offices, primarily in the States of Texas, Michigan, California, Florida and Arizona. Of the 591 locations, 236 were owned and 355 were leased. As of December 31, 2016, affiliates also operated from leased spaces in Denver, Colorado; Wilmington, Delaware; Oakbrook Terrace, Illinois; Boston, Massachusetts; Minneapolis, Minnesota; Morristown, New Jersey; New York, New York; Rocky Mount, North Carolina; Memphis, Tennessee; McLean, Virginia; Bellevue and Seattle, Washington; Monterrey, Mexico; Toronto, Ontario, Canada and Windsor, Ontario, Canada. Comerica and its subsidiaries own, among other properties, a check processing center in Livonia, Michigan, and three buildings in Auburn Hills, Michigan, used mainly for lending functions and operations. The common stock of Comerica Incorporated is traded on the New York Stock Exchange (NYSE Trading Symbol: CMA). At February 7, 2017, there were approximately 9,581 record holders of Comerica's common stock. Quarterly cash dividends were declared during 2016 and 2015 totaling $0.89 and $0.83 per common share per year, respectively. The following table sets forth, for the periods indicated, the high and low sale prices per share of Comerica's common stock as reported on the NYSE Composite Transactions Tape for all quarters of 2016 and 2015, as well as dividend information. A discussion of dividend restrictions is set forth in Note 20 of the Notes to Consolidated Financial Statements located on pages F-99 through F-100 of the Financial Section of this report, in the "Capital" section on pages F-19 through F-22 of the Financial Section of this report and in the “Supervision and Regulation” section of this report. On July 26, 2016, the Board of Directors of Comerica authorized the repurchase of up to an additional 10.0 million shares of Comerica Incorporated outstanding common stock, in addition to the 5.7 million shares remaining at June 30, 2016 under the Board's prior authorizations for the equity repurchase program initially approved in November 2010. Including the July 2016 authorization, a total of 50.3 million shares and 14.1 million warrants (12.1 million share-equivalents) have been authorized for repurchase under the equity repurchase program since its inception in 2010. There is no expiration date for Comerica's equity repurchase program. The following table summarizes Comerica's equity repurchase activity for the year ended December 31, 2016. Comerica made no repurchases of warrants under the repurchase program during the year ended December 31, 2016. Upon exercise of a warrant, the number of shares with a value equal to the aggregate exercise price is withheld from an exercising warrant holder as payment (known as a "net exercise provision"). During the year ended December 31, 2016, Comerica withheld the equivalent of approximately 2,319,000 shares to cover an aggregate of $68.2 million in exercise price and issued approximately 2,317,000 shares to the exercising warrant holders. Shares withheld in connection with the net exercise provision are not included in the total number of shares or warrants purchased in the above table. Includes approximately 235,000 shares (including 9,000 shares in the quarter ended December 31, 2016) purchased pursuant to deferred compensation plans and shares purchased from employees to pay for taxes related to restricted stock vesting under the terms of an employee share-based compensation plan and 26 shares purchased by affiliated purchasers through employee benefits plan transactions during the year ended December 31, 2016. These transactions are not considered part of Comerica's repurchase program. Includes July 26, 2016 equity repurchase authorization for up to an additional 10.0 million shares. Reference is made to the sections entitled “2016 Overview and 2017 Outlook,” “Results of Operations," "Strategic Lines of Business," "Balance Sheet and Capital Funds Analysis," "Risk Management," "Critical Accounting Policies," "Supplemental Financial Data" and "Forward-Looking Statements" on pages F-4 through F-43 of the Financial Section of this report. Reference is made to the subheadings entitled “Market and Liquidity Risk,” “Operational Risk,” “Compliance Risk” and “Strategic Risk” on pages F-32 through F-37 of the Financial Section of this report. Reference is made to the sections entitled “Consolidated Balance Sheets,” “Consolidated Statements of Income,” “Consolidated Statements of Comprehensive Income,” “Consolidated Statements of Changes in Shareholders' Equity,” “Consolidated Statements of Cash Flows,” “Notes to Consolidated Financial Statements,” “Report of Management,” “Reports of Independent Registered Public Accounting Firm,” and “Historical Review” on pages F-44 through F-114 of the Financial Section of this report. The remainder of the response to this item will be included under the sections captioned “Information About Nominees,” “Committees and Meetings of Directors,” “Committee Assignments,” “Executive Officers” and “Section 16(a) Beneficial Ownership Reporting Compliance” of Comerica's definitive Proxy Statement relating to the Annual Meeting of Shareholders to be held on April 25, 2017, which sections are hereby incorporated by reference. The response to this item will be included under the sections captioned “Compensation Committee Interlocks and Insider Participation,” “Compensation Discussion and Analysis,” “Compensation of Directors,” “Governance, Compensation and Nominating Committee Report,” “2016 Summary Compensation Table,” “2016 Grants of Plan-Based Awards,” “Outstanding Equity Awards at Fiscal Year-End 2016,” “2016 Option Exercises and Stock Vested,” “Pension Benefits at Fiscal Year-End 2016,” “2016 Nonqualified Deferred Compensation,” and “Potential Payments upon Termination or Change of Control at Fiscal Year-End 2016” of Comerica's definitive Proxy Statement relating to the Annual Meeting of Shareholders to be held on April 25, 2017, which sections are hereby incorporated by reference. The response to this item will be included under the sections captioned “Security Ownership of Certain Beneficial Owners,” “Security Ownership of Management” and "Securities Authorized for Issuance Under Equity Compensation Plans" of Comerica's definitive Proxy Statement relating to the Annual Meeting of Shareholders to be held on April 25, 2017, which sections are hereby incorporated by reference. The response to this item will be included under the sections captioned “Director Independence and Transactions of Directors with Comerica,” “Transactions of Related Parties with Comerica,” and “Information about Nominees” of Comerica's definitive Proxy Statement relating to the Annual Meeting of Shareholders to be held on April 25, 2017, which sections are hereby incorporated by reference. The response to this item will be included under the section captioned “Independent Registered Public Accounting Firm” of Comerica's definitive Proxy Statement relating to the Annual Meeting of Shareholders to be held on April 25, 2017, which section is hereby incorporated by reference. Financial Statements: The financial statements that are filed as part of this report are included in the Financial Section on pages F-44 through F-111. 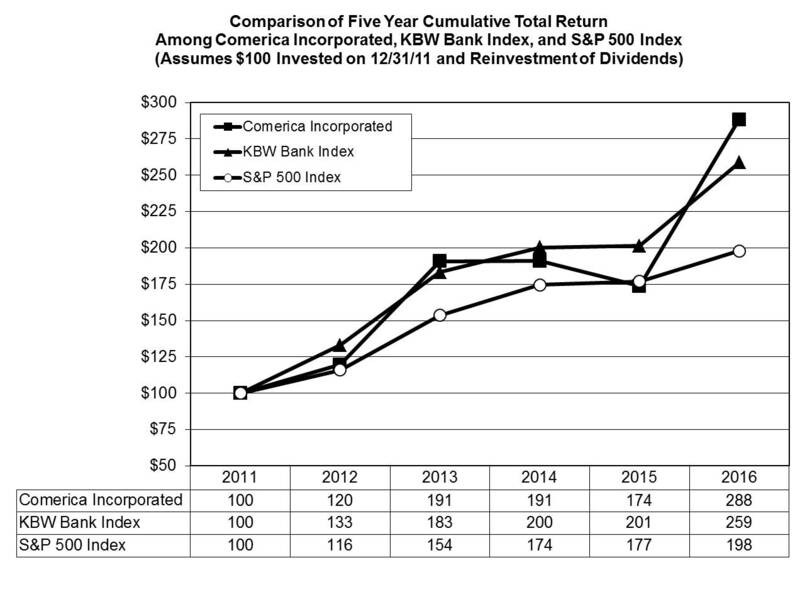 The graph shown below compares the total returns (assuming reinvestment of dividends) of Comerica Incorporated common stock, the S&P 500 Index, and the KBW Bank Index. The graph assumes $100 invested in Comerica Incorporated common stock (returns based on stock prices per the NYSE) and each of the indices on December 31, 2011 and the reinvestment of all dividends during the periods presented. Effective January 1, 2015, contractual changes to a card program resulted in a change to the accounting presentation of the related revenues and expenses. The effect of this change was an increase of $177 million in 2015 to both noninterest income and noninterest expenses. Amounts prior to 2015 reflect revenues from this card program net of related noninterest expenses. Noninterest expenses in 2016 included restructuring charges of $93 million. Ratios calculated based on the risk-based capital requirements in effect at the time. The U.S. implementation of the Basel III regulatory capital framework became effective on January 1, 2015, with transitional provisions. Comerica Incorporated (the Corporation) is a financial holding company headquartered in Dallas, Texas. The Corporation's major business segments are the Business Bank, the Retail Bank and Wealth Management. The core businesses are tailored to each of the Corporation's three primary geographic markets: Michigan, California and Texas. Information about the activities of the Corporation's business segments is provided in Note 23 to the consolidated financial statements. In the second quarter 2016, the Corporation launched the Growth in Efficiency and Revenue (GEAR Up) initiative in order to meaningfully enhance profitability. Actions identified under this initiative are expected to drive additional annual pre-tax income, before restructuring charges, of approximately $270 million for full-year 2018. Additional financial targets expected from GEAR Up include a double-digit return on equity and an efficiency ratio at or below 60 percent by year-end 2018. 2016 progress included a reduction in workforce and a significant reduction in retirement plan expense due to a new retirement program, which together resulted in 2016 expense savings of more than $25 million, as well as the consolidation of 19 banking centers. For additional information regarding retirement plan changes, refer to the "Critical Accounting Policies" section of this financial review and Note 17 to the consolidated financial statements. Expense reductions are expected to save an additional $125 million in full-year 2017, relative to the 2016 GEAR Up savings of more than $25 million, and increase to approximately $200 million in full-year 2018. This is to be achieved through continued savings from the reduction in workforce and the new retirement program, streamlining operational processes, real estate optimization, including consolidating an additional 19 banking centers in 2017 as well as reducing office and operations space, selective outsourcing of technology functions and reduction of technology system applications. Revenue enhancements are expected to ramp-up to approximately $30 million in full-year 2017, gradually increasing to approximately $70 million in full-year 2018, through expanded product offerings, enhanced sales tools and training and improved customer analytics to drive opportunities. Pre-tax restructuring charges of $140 million to $160 million in total are expected to be incurred through 2018. This includes restructuring charges totaling $93 million, which were incurred through December 31, 2016, and an additional $25 million to $50 million expected in 2017. For additional information regarding restructuring charges, refer to Note 22 to the consolidated financial statements. Net income was $477 million in 2016, a decrease of $44 million, or 8 percent, compared to $521 million in 2015. Net income per diluted common share was $2.68 in 2016, compared to $2.84 in 2015. Excluding the after-tax impact of restructuring charges associated with GEAR Up of $59 million, or $0.34 per share, net income increased $15 million, or 3 percent. Average loans were $49.0 billion in 2016, an increase of $368 million, or 1 percent, compared to 2015. Excluding a $641 million decrease in Energy, average loans increased $1.0 billion, primarily reflecting increases in Commercial Real Estate, National Dealer Services and Mortgage Banker Finance, partially offset by decreases in general Middle Market and Corporate Banking. Municipalities (a general Middle Market business), Corporate Banking and the Financial Services Division (a general Middle Market business), partially offset by increases in the remaining general Middle Market businesses and Retail Banking. Net interest income was $1.8 billion in 2016, an increase of $108 million, or 6 percent, compared to 2015. The increase in net interest income resulted primarily from higher interest rates, loan growth and a larger securities portfolio, partially offset by higher debt costs. The provision for credit losses was $248 million in 2016, an increase of $101 million compared to 2015, primarily reflecting increased reserves for Energy and energy-related loans recorded in the first quarter 2016, partially offset by improved credit quality in the remainder of the portfolio. Net credit-related charge-offs were $157 million, or 0.32 percent of average loans, for 2016, an increase of $46 million compared to 2015. The increase was primarily due to an increase in charge-offs in the Energy portfolio. Noninterest income increased $16 million, or 2 percent, in 2016, compared to 2015. Customer-driven fees increased $22 million and non-fee categories declined $6 million. An increase in card fees as well as growth in fiduciary, customer derivative and foreign exchange income was partially offset by lower commercial lending fees and investment banking income. Noninterest expenses increased $103 million, or 6 percent, in 2016, compared to 2015. Excluding $93 million of restructuring charges related to the GEAR Up initiative and $33 million from the net release of litigation reserves in 2015, noninterest expenses decreased $23 million. This primarily reflected a decrease of $48 million in salaries and benefits expense, including GEAR Up savings estimated to be in excess of $25 million as well as an additional decrease in pension expense, partially offset by the impact of merit increases and one additional day in 2016. Additionally, increases in technology expense, outside processing fees and FDIC insurance premiums were partially offset by decreases in state business taxes and gains from the early termination of leveraged lease transactions. The provision for income taxes decreased $36 million in 2016, compared to 2015. The effective tax rate was 28.8 percent in 2016, compared to 30.5 percent in 2015, primarily reflecting a $10 million increase in tax benefits from the early termination of certain leveraged lease transactions. The quarterly dividend was increased to 22 cents per share in April 2016 and to 23 cents per share in July 2016. The Corporation repurchased approximately 6.6 million shares of common stock during 2016 under the equity repurchase program. Together with dividends of $0.89 per share, $458 million, or 96 percent of 2016 net income, was returned to shareholders. Average loans higher, in line with Gross Domestic Product growth, reflecting increases in most lines of business and reduced headwinds from a declining Energy portfolio. Net interest income higher, reflecting the benefit from the December 2016 short-term rate increase and loan growth, partially offset by higher funding costs and minor loan yield comparison. Full-year benefit from the December rise in short-term rates expected to be more than $70 million, assuming a 25 percent deposit beta. Provision for credit losses lower, with continued solid performance of the overall portfolio. Provision and net charge-offs in line with historical normal levels of 30-40 basis points. Noninterest income higher, with the execution of GEAR Up opportunities, modest growth in treasury management and card fees, as well as wealth management products such as fiduciary and brokerage services. Increase of 4 percent to 6 percent. Noninterest expenses lower, reflecting lower restructuring charges and an additional $125 million in GEAR Up savings, relative to 2016 GEAR Up savings of more than $25 million. Outside processing is expected to increase in line with growing revenue. Headwinds include increased technology costs and higher FDIC insurance expense, as well as typical inflationary pressure. The gains of $13 million in 2016 from early terminations of certain leveraged lease transactions are not expected to repeat. Restructuring charges of $25 million to $50 million, compared to $93 million in 2016. Remaining noninterest expenses 1 percent to 2 percent lower. Decrease of 4 percent to 5 percent including restructuring charges. Income tax expense to approximate 33 percent of pre-tax income excluding the impact of discrete items such as the tax benefit related to stock compensation of approximately $14 million recorded during January 2017. The following provides a comparative discussion of the Corporation's consolidated results of operations for 2016 compared to 2015. A comparative discussion of results for 2015 compared to 2014 is provided at the end of this section. For a discussion of the Critical Accounting Policies that affect the Consolidated Results of Operations, see the "Critical Accounting Policies" section of this Financial Review. Average rate is calculated on a fully taxable equivalent (FTE) basis using a federal tax rate of 35%. The FTE adjustment to net interest income was $4 million in each of the three years presented. Accretion of the purchase discount on the acquired loan portfolio of $4 million, $7 million and $34 million in 2016, 2015 and 2014, respectively, increased the net interest margin by 1 basis point in both 2016 and 2015 and 6 basis points in 2014. Includes investment securities available-for-sale and investment securities held-to-maturity. Average rate based on average historical cost. Carrying value exceeded average historical cost by $143 million, $100 million and $12 million in 2016, 2015 and 2014, respectively. Medium- and long-term debt average balances included $162 million, $160 million and $192 million in 2016, 2015 and 2014, respectively, for the gain attributed to the risk hedged with interest rate swaps. Interest expense on medium-and long-term debt was reduced by $60 million, $70 million, and $72 million in 2016, 2015 and 2014, respectively, for the net gains on these fair value hedge relationships. Reflected a decrease of $27 million in accretion of the purchase discount on the acquired loan portfolio in 2015. Net interest income is the difference between interest earned on assets and interest paid on liabilities. Gains and losses related to the effective portion of risk management interest rate swaps that qualify as hedges are included with the interest expense of the hedged item. Net interest income comprised 63 percent, 62 percent, and 66 percent of total revenues in 2016, 2015, and 2014, respectively. The decrease in net interest income as a percentage of total revenues in 2015 was due to an increase in noninterest income resulting from a change in the accounting presentation associated with contractual changes to a card program. Refer to the Analysis of Net Interest Income and the Rate Volume Analysis tables above for an analysis of net interest income for the years ended December 31, 2016, 2015, and 2014 and details of the components of the change in net interest income for 2016 compared to 2015 and 2015 compared to 2014. Net interest income was $1.8 billion in 2016, an increase of $108 million compared to 2015. The increase in net interest income resulted primarily from higher yields on loans and Federal Reserve Bank (FRB) deposits, driven mainly by increases in short-term rates, and earning asset volume, partially offset by higher funding costs, primarily the result of higher costs on debt swapped to variable rate and new Federal Home Loan Bank (FHLB) borrowings in the second quarter 2016. For additional information regarding medium- and long-term debt, refer to Note 12 to the consolidated financial statements. Average earning assets increased $1.4 billion, or 2 percent, primarily reflecting increases of $2.1 billion in average investment securities and $368 million in average loans, partially offset by a decrease of $1.1 billion in average interest-bearing deposits with banks. bearing deposits with banks” on the consolidated balance sheets. Lower yielding FRB deposits decreased net interest margin by 17 basis points in 2016 and 23 basis points in 2015. The provision for credit losses was $248 million in 2016, compared to $147 million in 2015. The provision for credit losses includes both the provision for loan losses and the provision for credit losses on lending-related commitments. The provision for loan losses is recorded to maintain the allowance for loan losses at the level deemed appropriate by the Corporation to cover probable credit losses inherent in the portfolio. The provision for loan losses was $241 million in 2016, an increase of $99 million compared to $142 million in 2015, primarily reflecting increased reserves for Energy and energy-related loans recorded in the first quarter 2016, partially offset by improved credit quality in the remainder of the portfolio. Net loan charge-offs in 2016 increased $46 million to $146 million, or 0.30 percent of average total loans, compared to $100 million, or 0.21 percent, in 2015. The increase primarily reflected an increase in charge-offs in Energy and a decrease in recoveries in Private Banking, partially offset by decreases in Technology and Life Sciences and Small Business (primarily due to the charge-off of a single large credit in 2015). The provision for credit losses on lending-related commitments is recorded to maintain the allowance for credit losses on lending-related commitments at the level deemed appropriate by the Corporation to cover probable credit losses inherent in lending-related commitments. The provision for credit losses on lending-related commitments was $7 million in 2016 and $5 million in 2015. Lending-related commitment charge-offs were $11 million in 2016 and $1 million in 2015.